Just when life couldn't get any more exciting, I got the mother of all phone calls. How would I like to be cooking alongside the one and only Madhur Jaffrey for her BIG British TV comeback later this year? Erm, how would I like to win the lottery, stop ageing and sleep uninterrupted for the rest of eternity? Turns out they were looking for someone who works, has a busy family life and shamelessly reaches for shortcuts to get proper Indian food on the table, quick. So the first thing I did was call our architect/design agony uncle, Christophe Spiers of Thomas and Spiers. A dab hand at chappati rolling too, he vetoed the keeping-the-spotty-oil cloth idea and gave me orange and yellow as key kitchen accent colours. Next step, an emergency Shellac manicure and hair rescue by the lovely people at Sanrizz. Whatever was I going to do with the kitchen things still lying in nameless boxes? And where would I hide the children? I plunged into action on the day. Dropped the kids off to nursery, borrowed serving dishes from our neighbours, got my shower cap on and fired up a big pot of Murgh Mattar Pulao, a one-pot chicken and pea rice, for the kids' lunch. As Madhurji's recipe master arrived half an hour before schedule, I made him in charge of the pulao and dashed upstairs to get ready/sedate myself. In the meantime, the crew arrived early followed closely with the legend herself. She was absolutely lovely. I felt less sick. We shot the first sequence and fed the kids, who'd returned from nursery and were working the cameras. All good so far. Then we took a lunch break. And I quietly offered everyone a bit of chicken pulao. With not enough plates to go around, disposable paper bowls were the order of the day. And she would love to try the Murgh Mattar Pulao. So I gave Madhur Jaffrey toddler food in a paper bowl. The shame. The horror. In case I end up on the edit floor, I want it on record that she liked the pulao (particularly expressing suprise at the chilli powder in it). So did the kids and the crew. And I do not serve guests food in disposable tableware normally. The recipe follows. Send magic dust for the TV debut later, will you? More details to follow. Chop the chicken into small bite-sized pieces and roughly chop up the tomatoes. In a sieve, wash the rice with cold water until the water runs dry. In a large pot, bring the oil to heat on high. When it’s hot, drop in the whole spices and as they sizzle up, toss in the chicken pieces. Brown the chicken for a couple of minutes, then mix in the tomatoes and the powdered spices. Fry for two minutes until the tomatoes start disintegrating. Next, stir in the rice and seal it in the chicken mixture for a minute. You will see the grains turning less translucent. Finally, mix in 3.5 cups of boiling water. Bring back to boil, then mix in the peas, cover and cook on a gentle simmer for 20 minutes until the water is absorbed and the rice is cooked. Resist the temptation to stir the rice while it’s cooking or you will get mushy rice. This is lovely served with thick natural yoghurt. My kids almost always eat the chicken and peas first, then make a yoghurty rice mix to spoon messily into their mouths! I follow suit… with some chilli pickle of course. OMFG! this is huge… but on a sidenote…hilarious should be your middle name! sending you all the gold dust and vibes for the big tv debut… pulao looks lovely! Nice pulao. I especially like the addition of peas. I have never tried that before. 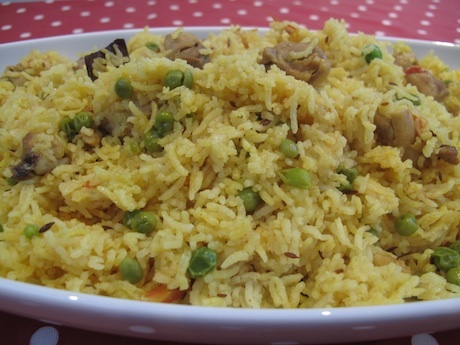 I always made either chicken or peas pulao – but the two together would make a complete meal. I am terrified of cooking rice in a pot though. I can never get it right. I’m going to try the rice cooker for the final bit – like I always do. I think it should work. Great dinner idea! Oh my GOD!!!!! You met her? In our own kitchen? And fed her your own cooked food?? You just walked into my dream and lived it, didn’t you Mallika!!! When, when, when ? Kothay dekhbo ? when would they air in India? Oh wow! You deserve it. And this is what I love about your recipes, simple yet so tasty. This is a great news indeed! Thanks for the recipe. Keep us updated. This is so exciting and delicious, I’m ready to leap into my computer screen! I’m so thrilled for you, Mallika, and can’t WAIT to see the show and tell everyone I know about it. 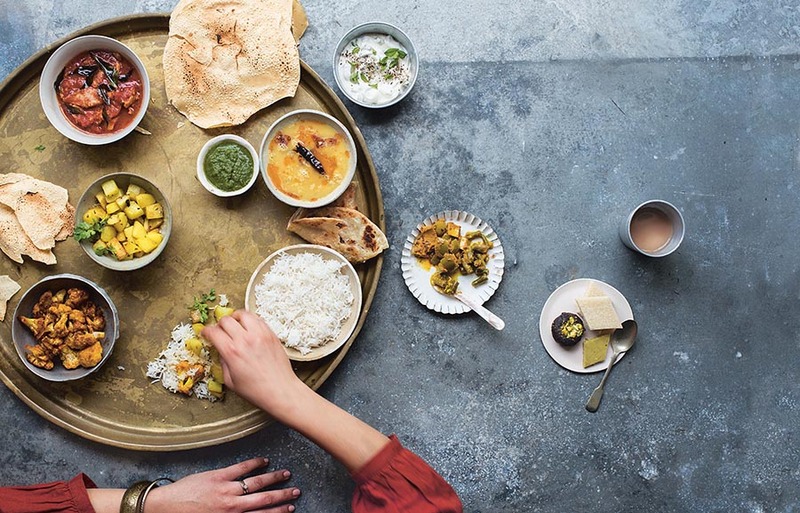 Although, it’s no surprise to your blog readers that Madhur Jaffrey loved your food!!! That’s quite an honor , Madjur Jaffrey!! how awesome Mallika! Congratulations! You would be great on T.V and that too with Madhur Jaffrey! What an honour! Would love to see the link someday..
OMG, I am so excited about this! You and Madhur are the two I consult the most in my kitchen! Looks great! I was updating my wine and Indian food tips (which was prompted by a post of yours going way back) and reminded me I hadn’t stopped over here in a bit. Exciting about the TV opportunity! I will take a note of your blog and keep cchecking for new details about once per week.